Loyalty Cards The Boot Group organises fantastic, family friendly and very busy Car Boot Sales in Essex on Wednesdays, Saturdays and Bank Holiday Mondays. GET YOUR FIFTH PITCH HALF PRICE AND THE TENTH ENTIRELY FREE! Please ask for your Loyalty Card when you visit the car boot sale. Offer valid at the WEELEY CAR BOOT SALE on SATURDAYS and BANK HOLIDAY MONDAYS ONLY. 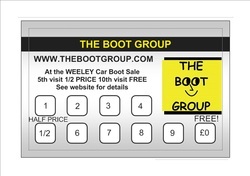 Your Loyalty Card will be stamped for each pitch purchased AT THE WEELEY CAR BOOT SALE during the promotion period. Not valid with any other offer. cashier to claim your half price pitch, keep the card and once you have collected 9 stamps then the your next pitch will be free. 1 stamp per day per pitch. No photocopied, damaged or defaced Loyalty Cards will be accepted. Subject to availability. The Loyalty Card is and will remain the property of the promoter. The promoter’s decision is binding and final on all matters. The promoter reserves the right to cancel this offer and this Loyalty Card at any stage prior to the Loyalty Card’s presentation in the event of exceptional circumstances beyond his control.